In a role that’s considerably less fun to watch than his scene-stealing moments in “Ant-Man and the Wasp,” Michael Pena stars in “Extinction” as Peter, a father and husband in the future who has visions of alien invasions. It makes him sleepless, and is driving him away from his wife Alice (Lizzy Caplan) and their two daughters, Lucy (Lilly Aspell) and Hanna (Amelia Crouch). Abruptly waking him up from sleep or knocking him out at work, these are violent images, of innocent people being fired upon by unidentified flying objects in the sky, buildings being blown up. Sci-fi movie kind of stuff. Rest assured, those visions aren’t far off, as about 30 minutes in “Extinction,” aliens do randomly start raining a hellfire down on Earth, looking to erase any living being. Even more, there are alien soldiers, with bug-like sounds and green bubbles all over their bodies, that take their hunt to the streets and inside Peter's apartment building. The main chunk of “Extinction,” then, becomes a full-on alien invasion and escape, full of alien baddies in big rubber suits shooting at human beings like it’s “The Purge,” or spaceships blowing up apartment buildings in the distance like it’s “Skyline” all over again. Either way, it’s a B-movie with a blockbuster attitude, and not in a fun way. The effects are cheap but the action even more so, relying on the numbing spectacle of shoot-outs, while creating a scant sense of dread as Peter and his family try to escape their apartment building safely. In terms of production design creativity, it’s all a step down from the "'Mad Men' of the future" look that "Extinction" has for its pre-invasion costumes and apartment designs, one of its only inspired choices. 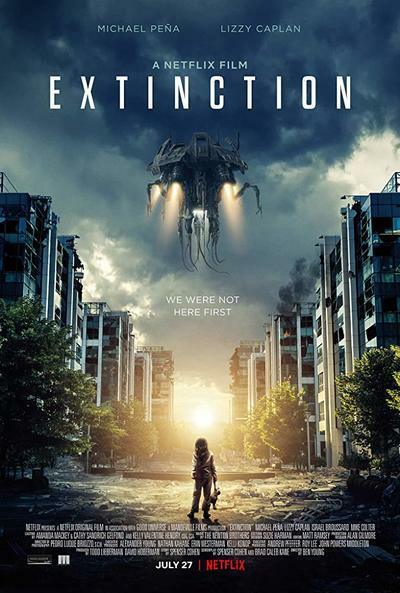 Thrills here come in nugget size: “Extinction” does provide Pena a lead action role to kick, punch, stab and shoot some aliens, injecting a wee bit of gusto into an otherwise very dour little story. Caplan, on the other hand, is given even less to work with, and their two young children who spend the whole time scream-crying (understandably so) even less than that. For fans of Netflix’s “Luke Cage,” Mike Colter is also in this thing, but his presence might be the most baffling, and underutilized, of all. He’s just another actor trying to legitimize "Extinction," even though you can imagine these actors just shrugging at each other when they were done filming each day. While the movie does feel like it’s going to be only a full-on alien invasion movie, it does reveal its other layers about an hour in. With respect to the filmmakers, including director Ben Young ("Hounds of Love") and screenwriters Spenser Cohen and Brad Caleb Kane, it doesn’t seem fair to discuss what that change is, even though it’s the reason this movie was likely so full-steam ahead on its cheesy concept (let’s just say that it refocuses the script with some timeliness). But just when you think the movie is about to get a little kooky, it only becomes quaint. One wishes that the movie went even further with its ideas, or tried to really discomfit viewers, but, no. Its strangest notion is that it's a family movie, if like with “Skyscraper,” your family can stomach the constant imagery of lots of people being shot. There’s a tightness that I respect with “Extinction.” It’s not so much a thrill-ride but a movie monorail, with one revelation at the end meant to make us reconsider the entire journey. That speaks to its efficiency as the latest in mindless, if not attention-less Netflix movies. "Extinction" doesn’t seek to be much, but it’s just not all that charming, either.